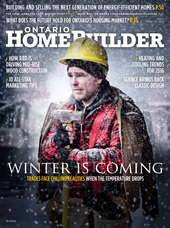 It’s quite literally the cold, hard truth for tradesfolk contracted by Ontario’s new-home builders: Come winter, life tends to get a little more complicated, and a lot slower. who has been framing homes for 20 years. “Winter framing can take 20%-25% longer. On a normal single-family house, what would usually take 8-10 working days in the summer becomes 10-13 in the winter. 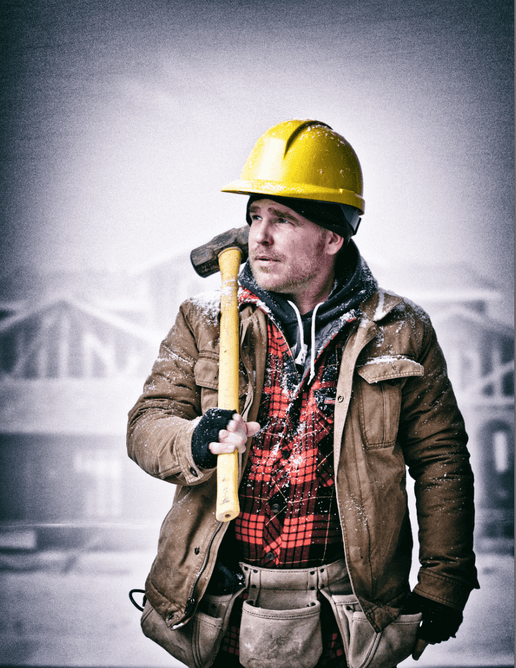 “There are a lot of days where we have to remove snow and ice until almost 11 a.m. before we can start cutting and nailing,” says Fraser, who now frames exclusively for Marz Homes. “We try to keep everything tarped if we know weather is coming, but a lot of times you have to take a sledgehammer to a big sheet of ice to get the wood apart. And, of course, the wood is harder to nail. You try to clean the snow off the tools as much as you can, but it really does wreck tools a lot quicker. Then the nail gun stops working. And we have to start using antifreeze in the lines of the pressure hoses. “Your physical movement slows down, and there’s not much you can do about it,” Fraser continues. “You go from wearing shorts and a T-shirt in the summer to wearing five layers, including a hard outer shell and gloves, which slows down your ability to mark stuff and pull nails out. While every trade has its challenges, the most problematic has traditionally been those dealing with concrete, as embattled workers attempt to pour and cure it before it freezes. But technology has at least come to the aid of that industry in recent years. Although they include a surcharge, superplasticizers (also known as high-range water reducers) provide a flowability to concrete and have given trades an additional 45 minutes to an hour to manoeuvre. There’s also self-consolidating concrete, which can be poured in one corner and, like soup, will flow evenly all the way around up to eight feet. “The danger factor increases, the conditions are more difficult and there is inevitably a higher percentage of errors, although we try to correct those errors as the job goes along,” adds a Niagara-area roofer. It’s not quite a case of frozen assets. The winter home building market will continue to evolve—even the ability of contractors to access up-to-the-minute weather information has marked a step forward in dealing with less-than-ideal conditions more efficiently.